When using straight edge and compass, you'll construct regular patterns with 2-, 4-, 6, 8 or 12-folded symmetry. 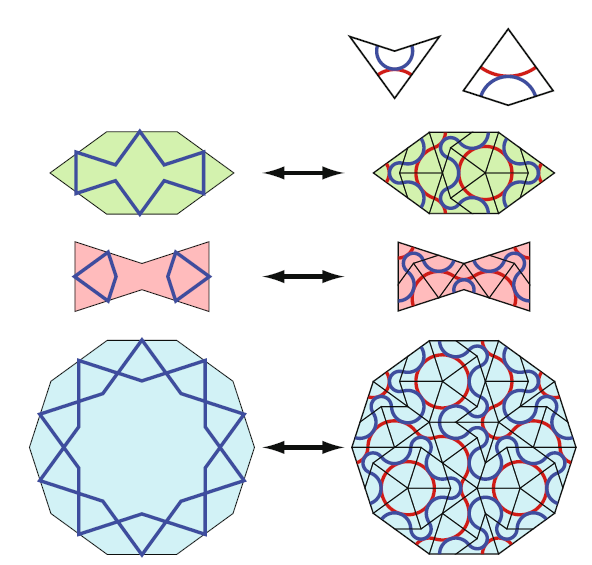 Pentagons ans decagons are possible but more complicated. But if you are free to match forms you will think more freely constructing other tilings. When using girih tiles, the forms refer to 5-folded symmetry and this too has its consequences. Penrose showed that one cannot create regular tesselations based on 5-folded symmetry, but one can create irregular tesselations with it. The study of Peter Lu shows that 800 years ago Islamic builders realised similar tesselations. Our story becomes even more beautiful when noticing that we can place Penrose kites and darts upon girih tiles. Applying this to girih patterns we get a match for a Penrose tiling on the whole pattern. For the mausoleum in Maragha there are just a few errors and which we can repair by replacing a hexagon and a bowtie. It can even be so that the mismatches are just mistakes or bad repairs. left: along the yellow dotted lines the matching doesn't fit. right: after replacing hexagon and bowtie the errors are fixed.